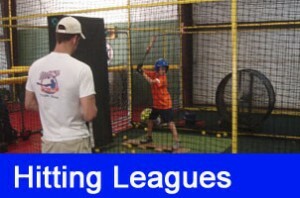 The first 4 weeks will run as normal, with our regular hitting league where teams of 3 compete against each other to see which team can score the most total points and win their division. Each week players will get a minimum of 90 swings! That’s a ton of swings. Games will be 9 innings or 50 minutes, whichever comes first. Points are scored based on how well the ball is hit, line drives of course score more points than pop ups or ground balls. The better the hit, the better the score! And then its Home Run Derby time! It’s every player for themselves as we see who can hit the most overall home runs and be crowned the champion! 4 hitting tunnels will be opened up to create one large hitting field. All hits over the back net wall will count as a home run, anything else is an out! Don’t miss this chance to get in a TON of practice swings, compete against other teams, all while having a great time! Space is very limited and spots will fill up fast.